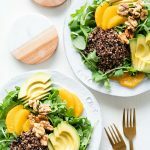 This Avocado Quinoa Power Salad is meal prep friendly! Full of fresh ingredients like creamy avocado, sweet oranges, peppery arugula, and crunchy walnuts. Prep your quinoa and dressing ahead of time for easy to assemble meals all week! ASSEMBLE SALAD: Divide fresh arugula between two large salad bowls – then add 1 cup of cold, cooked quinoa to each. Followed by the orange slices, avocado, and walnuts. Drizzle on desired amount of dressing, top with your favorite protein source (like chilled chicken breast or white beans) and eat immediately! *You can also just keep it simple if you don’t want to make your own dressing and pair this with either your favorite store bought dressing (a honey mustard vinaigrette will work great here) or simply drizzle on some extra virgin olive oil and a white balsamic vinegar straight on top. WAYS TO CUT THE ORANGES: You can either cut the oranges into supremes (as seen here), peel and chop them, or cut them into rounds. Whatever works for you. I do have a guide in this post linked HERE that shows you how to cut them into slices without as much of the white pith or membranes attached.